I was out west this year once again at the San Diego con with a large family contingent. The trip went as one might imagine ... incredible crowd sizes, frenetic, hectic craziness ... but a lot of fun. My middle younger brother Nicholas flew out from Minneapolis, and it was the first time we attended a con together since the days of Phil Seuling in the 1970's, where Harvey Kurtzman once saw him (my brother) fall off a chair during a panel, inquiring from the dais, "are you ok back there?" Contrary to complaints that the show isn't about comic books any longer, there were many, many dealers at the bottom of the arena and I was able to purchase a nice handful of Timely teen issues of the Cindy Comics and Lana Comics variety, as well as about 20 issues of Mad Magazine from the 1960's. I caught up with friends from fandom... Batton Lash, Jackie Estrada, Nicky Wheeler-Nicholson, Craig Yoe, Ger Apeldoorn, Alex Grand, even my pal Bill Cole, missed seeing a ton of others (I could not find Danny Fingeroth), took a lot of photos and video, attended several Jack Kirby panels celebrating the 100th anniversary of his birth, and there even was a meeting with Stan Lee himself ...... well, my wife Maggie had the meeting. An accidental one. On Saturday of the con, as we always do, my family splits up upon arrival. I go immediately to the comic dealers section and she heads for the craziness of the rest. My children go off on a third route, I have no idea where. At some point in the afternoon, we all get a group text message and a close-up photo of Stan Lee. 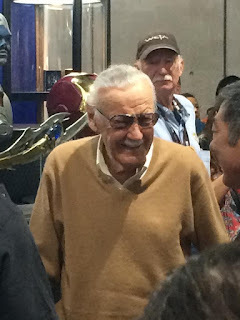 Now I should have really been more in tune with convention guests, and I think I'd heard Stan was a scheduled guest somewhere, but the recent passing of his wife Joan made me feel Stan might not attend. Well I was wrong. My wife ended up, completely by accident, somewhere in the middle of all the con craziness, standing right next to Stan Lee. She extended her hand and introduced herself as Michael Vassallo's wife. Stan, to his credit, immediately replied, "Mike Vassallo! I know him! Nice to finally meet you!" And with a parting "excelsior", he was whisked away by his "Secret Service" detail to wherever it was he was going. Which proves one indelible point. No matter how much you hate the main non-comics convention venue, always stay beside your wife or you'll be sorry. I am. The last day Sunday, July 23, started as always with me checking online as I got myself ready for breakfast at our hotel. Pulling up the page on my iPad, a short post in my Facebook feed at the very top stopped me cold... "R.I.P. 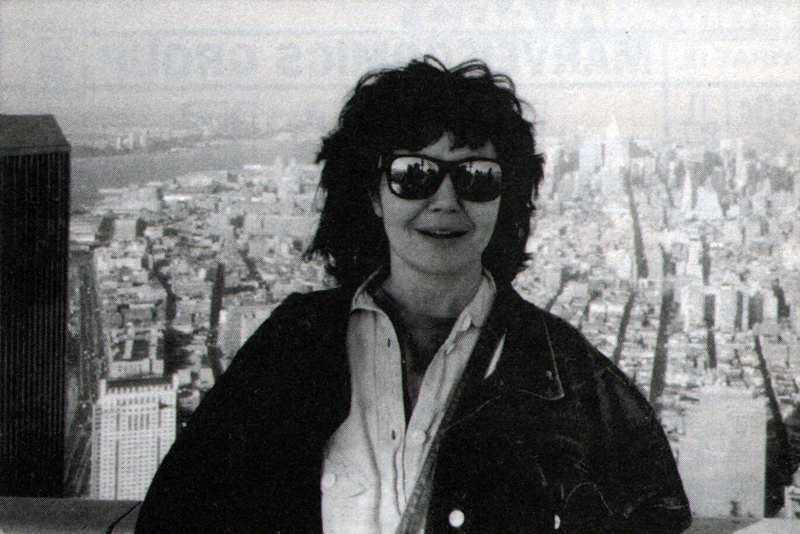 Flo Steinberg". Blood drained from my face and I immediately felt queasy with my heart pounding. I was stunned, yelling to my wife that an online report was saying Flo had died, which made her gasp in horror. 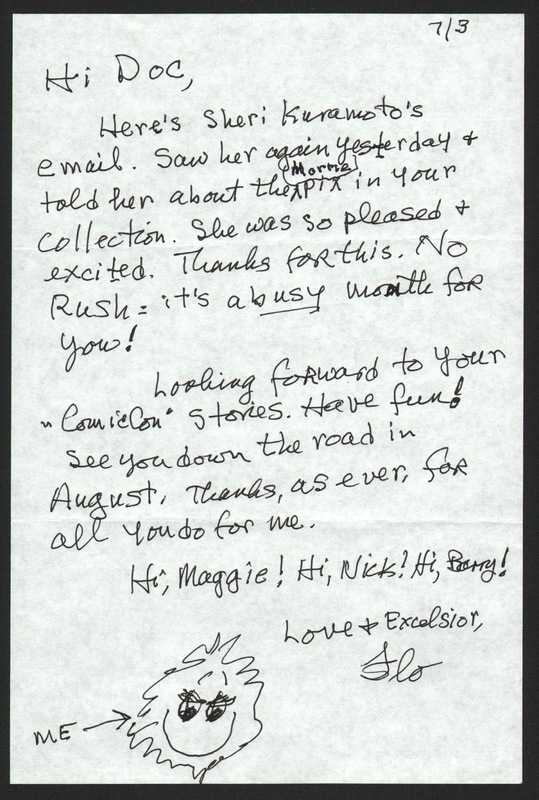 I immediately texted my friends Nick Caputo and Barry Pearl and asked them if they could confirm this, and Nick at 12 noon New York time, wrote back immediately, the solitary word.... "yes." It all started with Nick Caputo. Many years ago, 1996, 1997... I forget what year, Nick and I attended a con in New York and Flo was a guest, or an just an attendee, I also don't remember which. We were in the main dealers' room and Nick pointed out a smiling cute-as-a-button woman to me across the long aisle, exclaiming, "Hey! Flo Steinberg is here!" Standing all alone, with no one even recognizing her, Nick and I walked over and he introduced me, having previously known her from numerous talks and phone calls about the early days of Marvel. Flo was exactly how we all knew her, sweet as can be, smiling wide as the Cheshire Cat, friendly as a spring flower, and probably somewhat embarrassed by my gushing. We spoke for quite a while and then we parted, exchanging contact information so I could pursue additional questions in the future. The fact I was Nick's friend was a good enough "letter of introduction" for her. No one had any paper to write on and all I had in my wallet was one of my business cards, so I gave it to her and asked her to pay no attention to the front, while I wrote my home number on the back. She joked about needing a good dentist and we parted ways, Nick and I just thrilled by the meeting. I never did call Flo as time slipped away. 2007 I was in between secretaries and my wife Maggie filled in for what ended up being two years. One day I was perusing my appointment book and saw the name "Florence Steinberg" penciled in later in the week as a new patient, the appointment made by my wife who took the call. At first glance, nothing registered. In fact, I have several same named families as patients, so my thought was that it likely a relative of one of them. On the day of the appointment, I continued to inexplicably ponder the name, actually saying it over and over in my mind ... Florence Steinberg ... Florence Steinberg ... something just bothered me, as if I was partially recognizing the name on a subconscious level. Then in a flash it struck me, "Wait a minute! FLO STEINBERG??? It couldn't be!" I asked Maggie what she remembered about the woman on the phone and she replied something to the effect that it was just a nice sounding lady, nothing more she could recall. Well, as the time approached, I kept looking out to my small waiting room, straining to see if anyone had walked in. Soon I was busy and could not pay further attention, taking care of business and losing track of the time. At some point Maggie poked her head in and said casually, "Florence Steinberg is here," and I froze, rose and walked out to my waiting room to finally see who it actually was. She smiled and exclaimed, "Hi Doc!" We hugged and embraced like old friends. Recall that I had met her only one single time previously, 10 years earlier. I could not believe she was standing in my office. As Flo explained it, she had kept my old business card (10 years!) and when the time came, decided to call me up. I told her that I didn't care how insulted she was, I could never, ever, ever (ever!) accept remuneration for anything, something she was not initially happy about, but I was adamant and she relented. That began a ten year period of friendship that was as deep as it was wide. 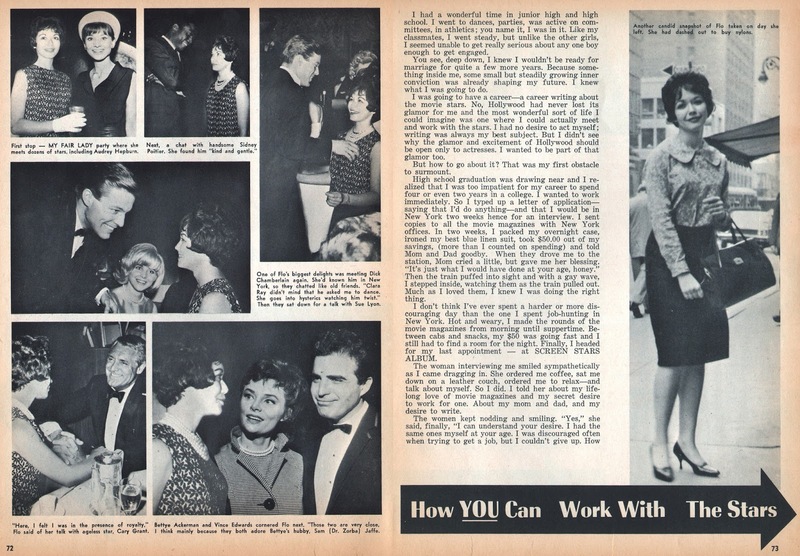 Flo came up every three months and we would have 2 hour lunches, usually at her favorite place, Burger Heaven on Lexington Avenue and 62nd street, occasionally joined by my wife Maggie. Before you know it, Nick Caputo and Barry Pearl, Flo and I were frequently having dinner together, a "real" Yancy Street Gang we were, with a bonafide charter member in our midst! For real! We were regulars at places as diverse as the Oyster Bar in Grand Central Terminal and The Pastrami King on Lexington Avenue. 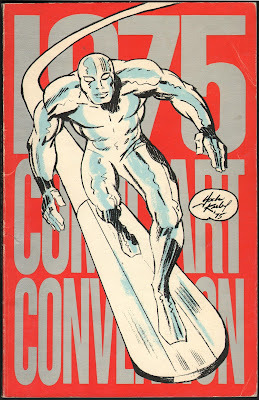 What great times we had, talking about everything under the sun, and rarely about comics. One evening, after a New York Comicon that Flo didn't even attend, she met us afterward for a nightcap of coffee and apple pie at her favorite diner on Lexington Avenue. Of course, our conversations were certainly occasionally about Marvel as Flo spun wonderful stories about her old days there. Flo and I missed sharing a birthday by a single day. 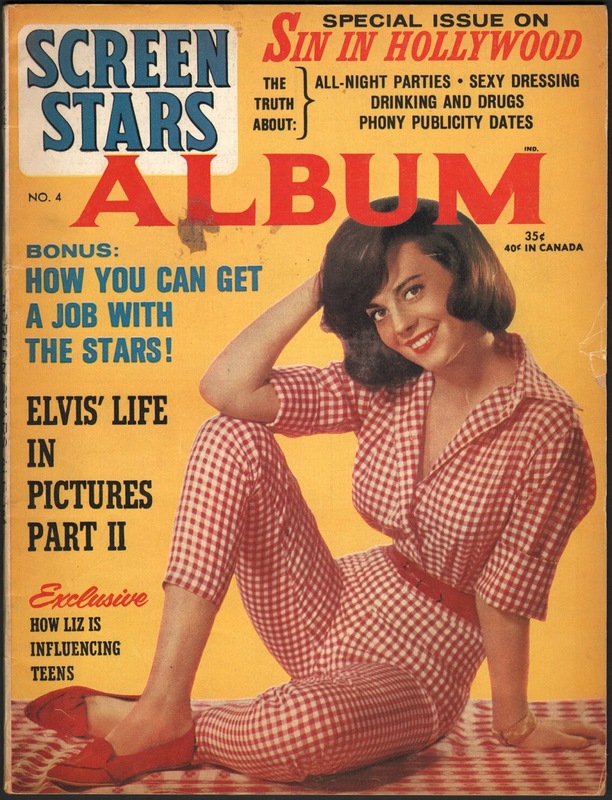 She was born on March 17 (in 1939) and I'm March 18. She grew up in Boston, graduating from UMass Amherst in 1960 and volunteered in campaigns of all three Kennedy brothers at one time or another. 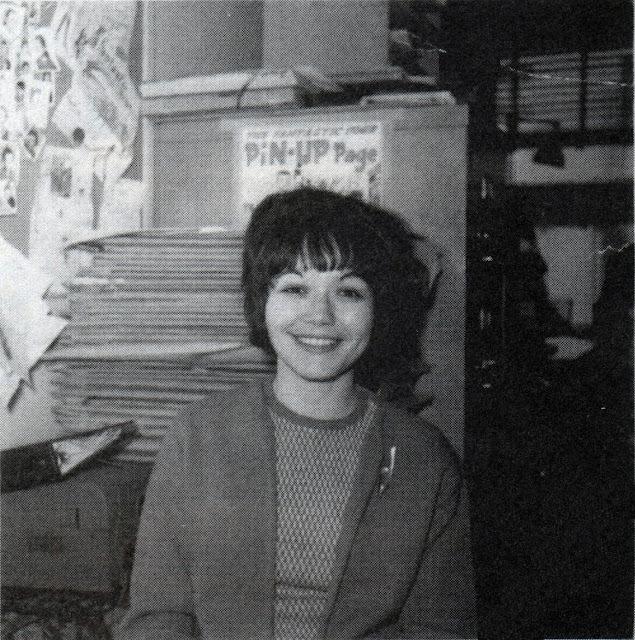 Her first job was with the New England Telephone Company but by March of 1963 she was being interviewed by Stan Lee for a secretarial job at the nascent Marvel Comics, where her job as Stan's "Gal Friday" or "Corresponding Secretary" actually included nearly everything under the sun short of actually creating the comics. 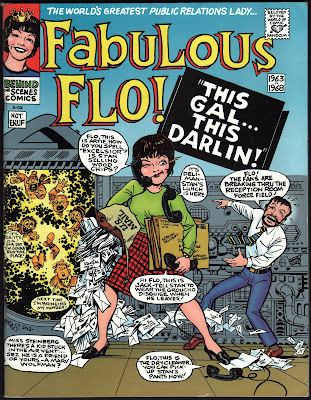 Dubbed "Fabulous Flo" by Stan Lee, she answered the phones, greeted guests, made sure the art went to the printer and answered fan mail that would bear Stan's signature. And she was a beloved figure in that tiny office with only a thin partition separating them from Goodman's Magazine Management department. "What was Jack Kirby like, Flo?" "Jack was nice!" "What was Steve Ditko like, Flo?" Steve was nice!" "What was Wally Wood like, Flo?" "Wally was nice!" "What was Stan Lee like, Flo?" "Stan was nice!" 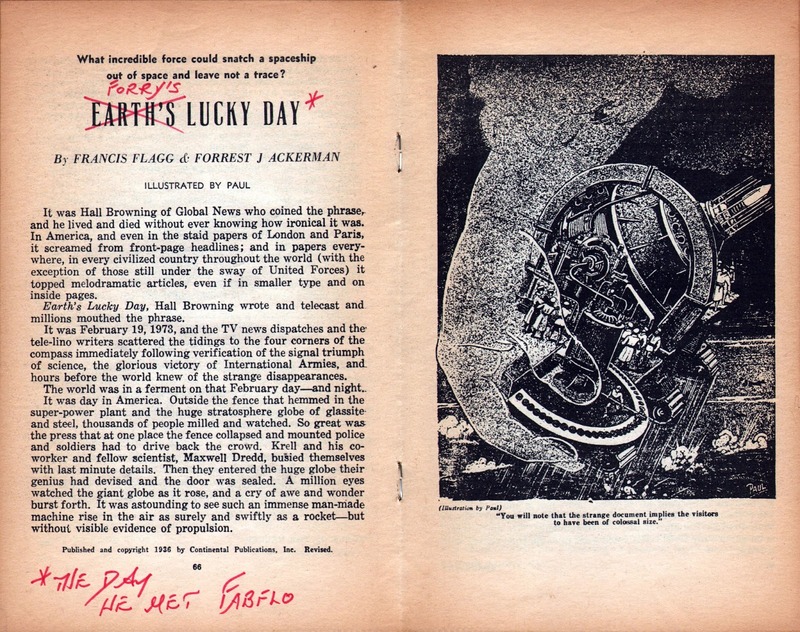 "What was Sol Brodsky like, Flo?" "Sol was nice!" "What was Federico Fellini like, Flo?" "He was nice!" 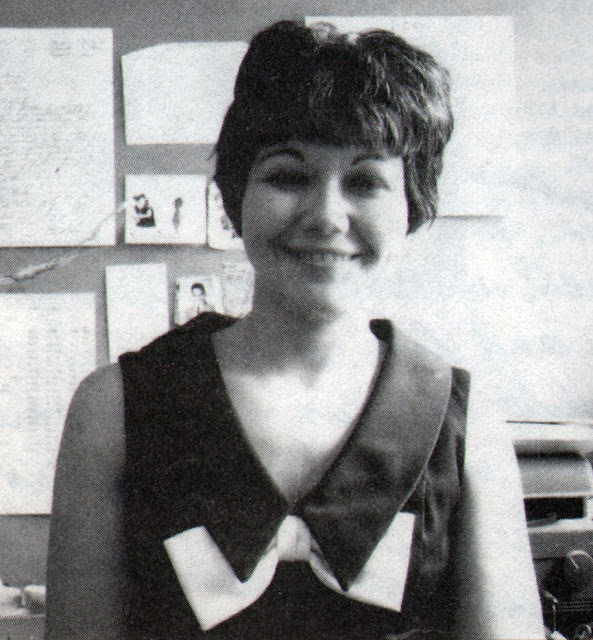 And take a good look at Jonah Jameson's secretary Betty Brant, as drawn by Steve Ditko starting in 1964 ... It's Flo! 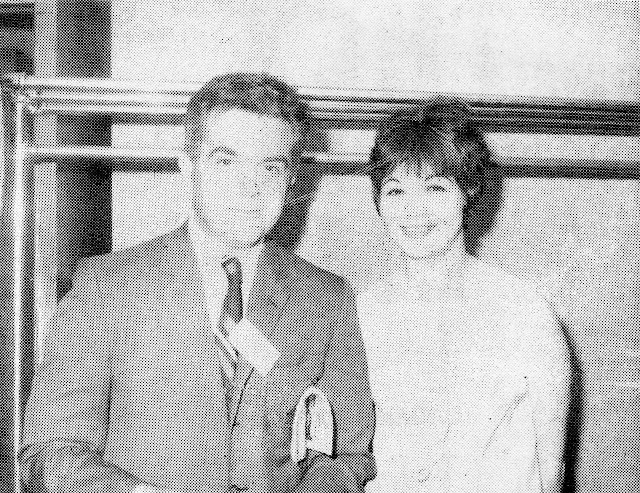 Flo often expressed her dismay in leaving Marvel in 1968 when she couldn't get a raise from Martin Goodman, calling him a cheapskate. A stunningly beautiful young woman, Flo was pursued by men who visited the office, one in particular Flo mentioned to me was Forry Ackerman, frequently up to see Magazine Management and who was frustrated by his lack of success in getting a date. Flo's appearances run from 2:50 to 3:06, 4:19 to 5:17 and 5:43-6:01. Flo's post-Marvel years were a swirling dive into the early Underground comix scene, taking her to San Francisco and Oregon before returning to work for Jim Warren. 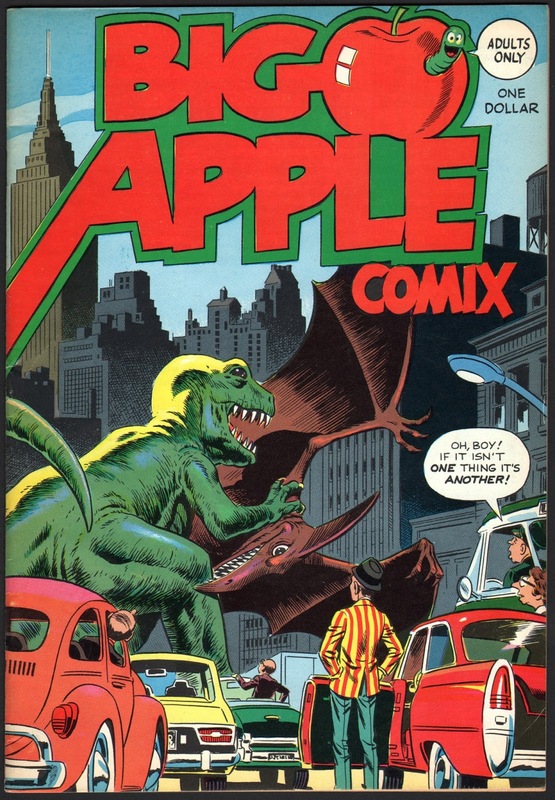 In 1975 she published BIG APPLE COMIX, becoming one of the very first Independent comics of all time. 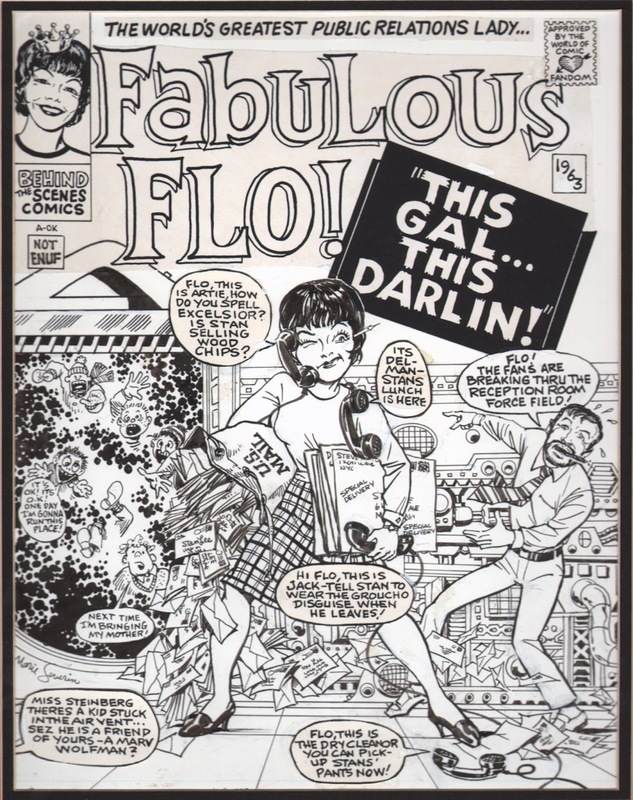 A "who's who" of top talent, both indie/underground and mainstream, all lent their skills to Flo's baby...... Wally Wood, Neil Adams, Al Williamson, Denny O'Neil, Archie Goodwin, Ralph Reese, Marie Severin, Paul Kirchner, Stu Schwartzberg, Alan Weiss, Herb Trimpe, Mike Ploog and Larry Hama all contributed. Production was handled by Linda Fite (who also contributed a strip inside), John Verpoorten and Michele Brand. Flo herself edited the issue. 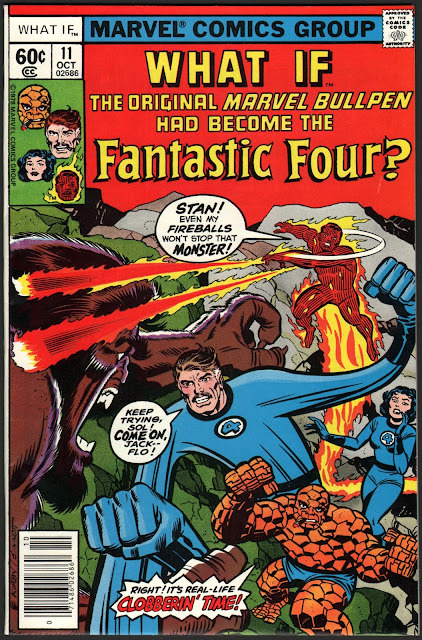 In 1978 Jack Kirby cast Flo as "The Invisible Girl" in his early Marvel bullpen send-up of the Fantastic Four in WHAT IF? 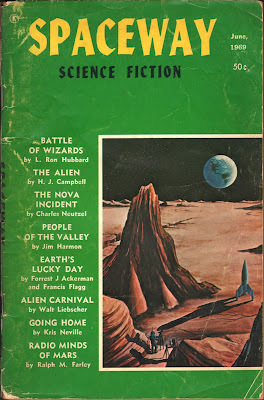 #11 (Oct/78). Flo was also concurrently now back working for Marvel (since the 1990's) as a proofreader and loved the fact that many of the young folks there didn't even know who she was. 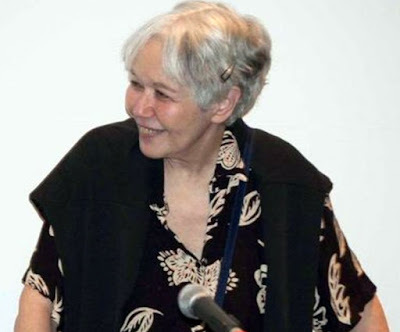 She always had wonderful things to say about all the editors there and one of her favorites was Marvel Masterworks editor Cory Sedlmeier, who adored Flo. In 2002 TwoMorrows Publications and Editor Jon B. Cooke devoted an entire half issue of the magazine COMIC BOOK ARTIST #18 (Mar/02) to a "Fabulous Flo Steinberg Celebration." A labor of love, four different articles were published over the course of 46 pages, including a great in-dept interview with Flo. 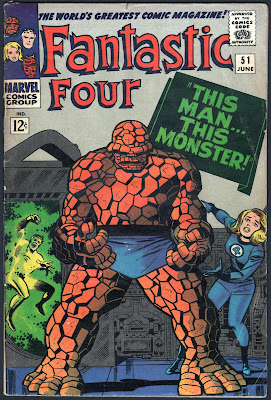 Marie Severin rendered a beautiful homage to Jack Kirby's iconic Fantastic Four #51 cover, complete with Kirby Krackle. 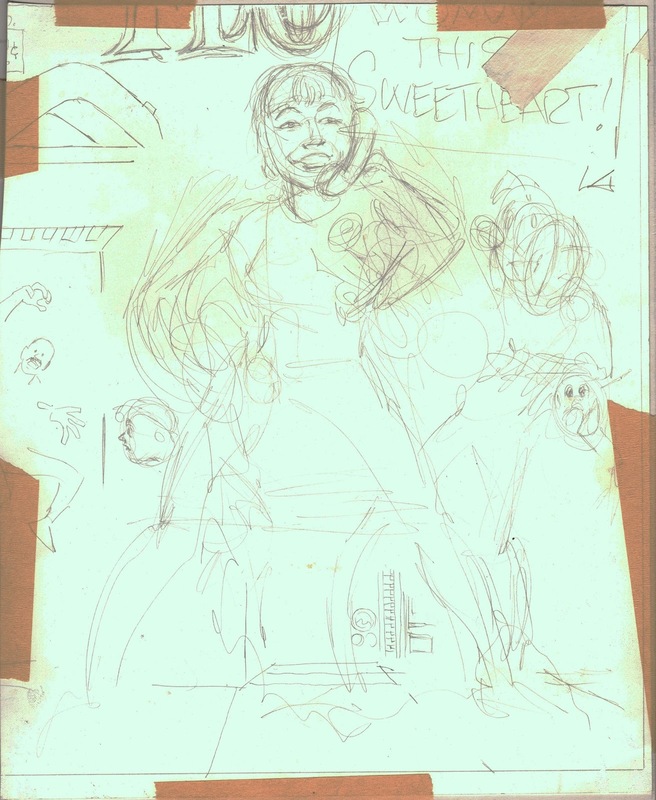 Flo provided tons of old photos of herself from the early days of Marvel. 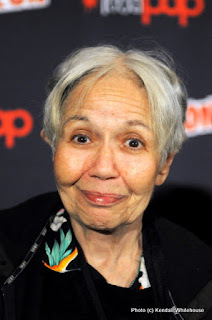 When she was invited back to attend the "50th anniversary of the original New York Comicon" panel at the 2014 New York Comicon (a con she originally attended back in 1964), she was initially reluctant to go. We spoke about the event and I wan't the only one to gently nudge her to accept. She ended up having a wonderful time and was glad she attended. She did say it was going to be the last time, though. 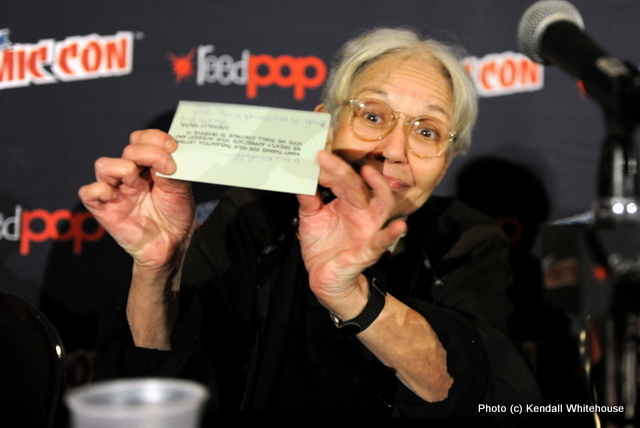 In the photo above, Flo is holding the original response card sent to Kendall Whitehouse. 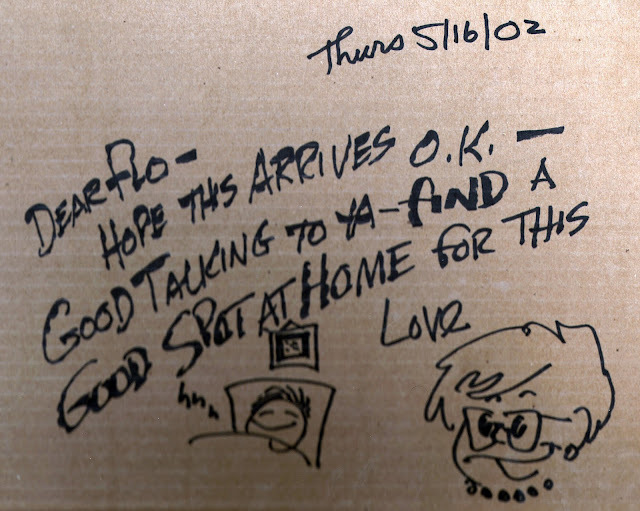 Kendall sent me an image of the original card he showed Flo at the con that Flo originally send him back in the mid 1960's. A private person, Flo never felt comfortable with all the attention fandom focused on her. 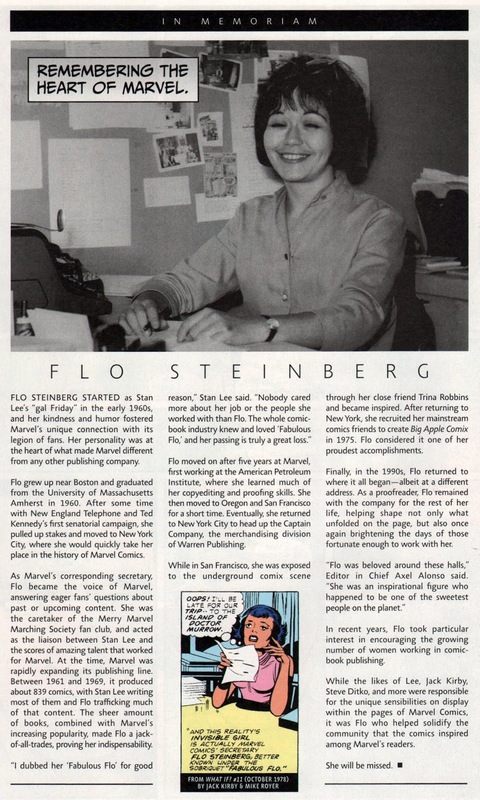 Over the years, in this century's golden-age of comics history research and book publication, every time someone wrote a book on some aspect of Marvel's sliver-age history, one of the first people to be contacted was Flo. 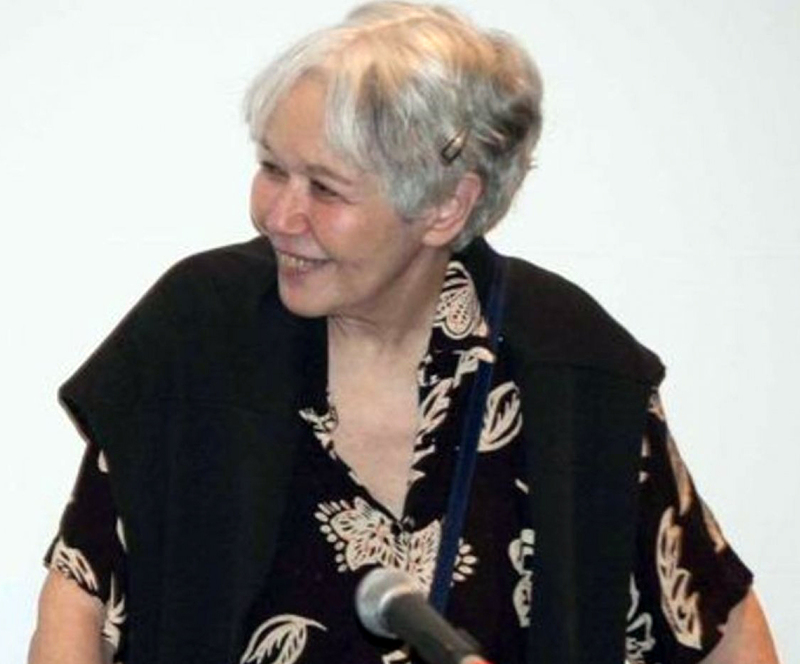 She would field phone calls from fans and authors alike, patiently answer as best she could, but confided to me she grew tired of it as time went on, repeating the same stories over and over. "It was just a job, I tell them what they want to hear," she'd say to me. Flo also was not keen on taking photos with fans. I knew this and never in 10 years ever asked her to take a photo with me. Now I wish I had. She wouldn't have refused. 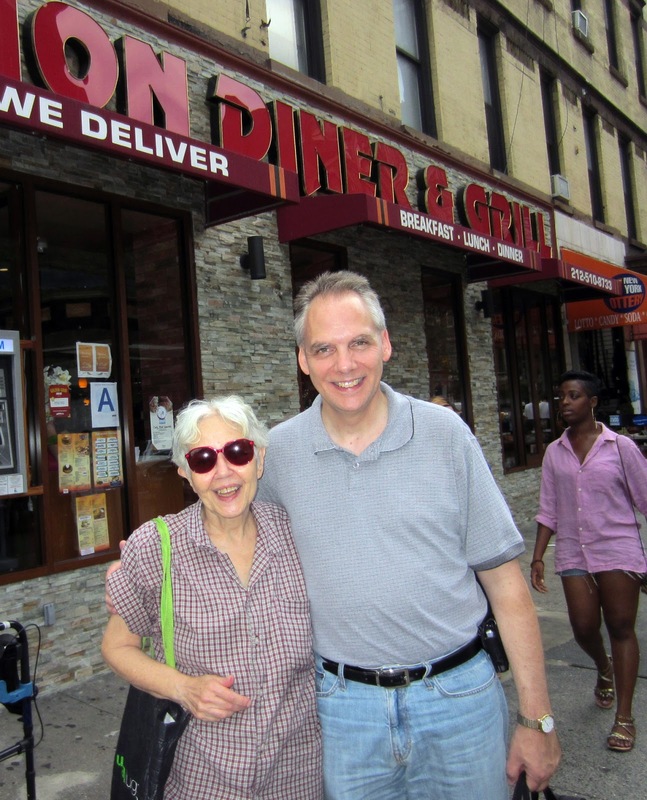 My pal, author Dewey Cassell, a close friend of Flo, took a great photo with her in 2012 outside one of Flo's favorite eating haunts downtown on a visit to New York. I cropped out several background individuals that Dewey said Flo thought looked straight out of central casting! Flo didn't want Dewey to publish the photo until she passed away, a morbid request to be sure, but showed the depths of her privacy wishes. I'm jealous, Dewey. Additionally, Flo did not suffer fools well and was annoyed by incompetence. This is why she was still in-demand as a proof-reader for Marvel. 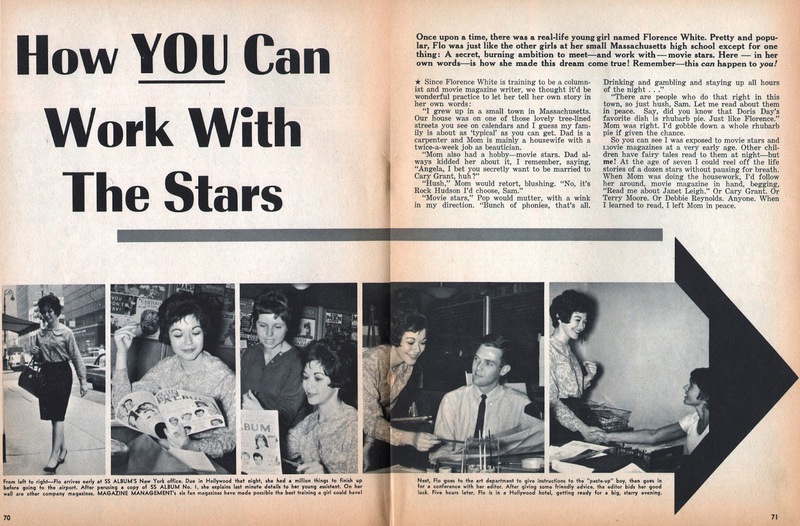 Flo would constantly complain about today's generation's inattention to proper grammar. It drove her crazy. She would say, "people think I'm always so nice, but I'm not." I would then call her a liar to her face and she'd break into a wide grin and laugh, saying, "Oh Doc, you just know me too well!" Truth be told, Flo rarely discussed Marvel and comics and was always more interested in our families and our pets, especially my Sheltie, Cindy. She would always ask about Cindy, knowing her as a young dog and grieving with our family when she passed away. She would even ask me how Barry's cats were doing, although she owned no pets of her own. Within the last two years, as friends and acquaintances one by one passed on, Flo would often wax melancholy and mention how she was starting to feel time slipping away. She had very close friends she would always talk to and occasionally socialize with. 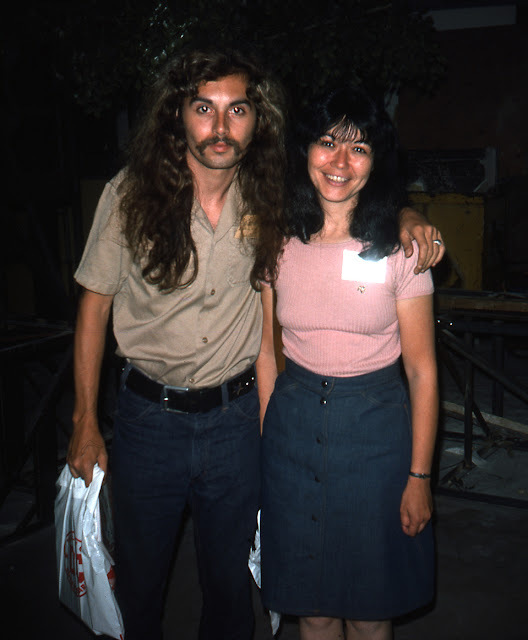 Linda Fite and Larry Hama being two of the closest. 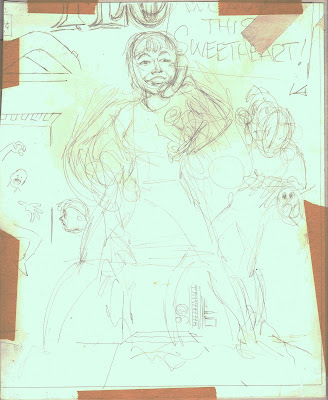 Additionally Marie Severin (before her own health downturn) and Trina Robbins, as well as others I'm forgetting (for which I apologize). She began to think about what was she going to do with all the "stuff" she had. Knowing I was a big science fiction and vintage paperback fan, Flo began to bring me stacks of her old paperbacks every time she saw me. 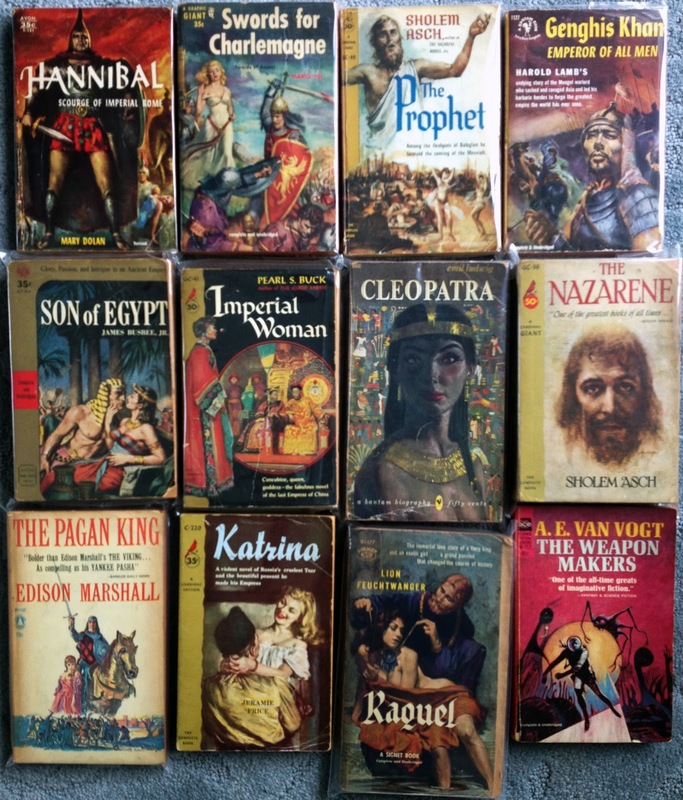 These books were battered, lovingly well-read and a wonderful cross-section of historical, science fiction and fantasy published primarily in the 1950's through early 1970's, publishers like Ace, Lancer, Cardinal, Daw, Pocket Books and Avon. I last saw Flo in January. We ate lunch at Burger Heaven on 62nd Street and took a walk around the block, past The Society of Illustrators. The weather was mild and we made our way back to my office corner. For a few moments we talked about possibly getting her to come up to my house for a visit on a weekend. 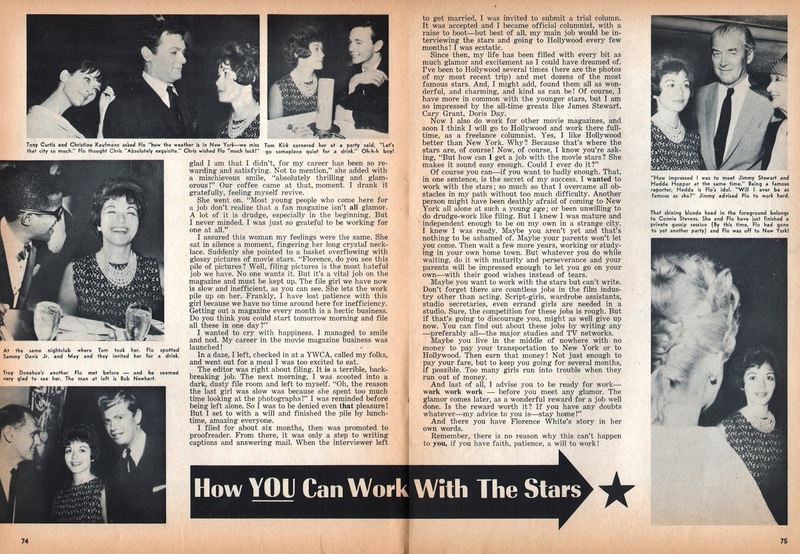 I had asked Flo up several times previously and Barry Pearl offered to drive her up on a Saturday with Nick Caputo to spend the day with us and Maggie. Flo thought the idea wonderful but never committed. 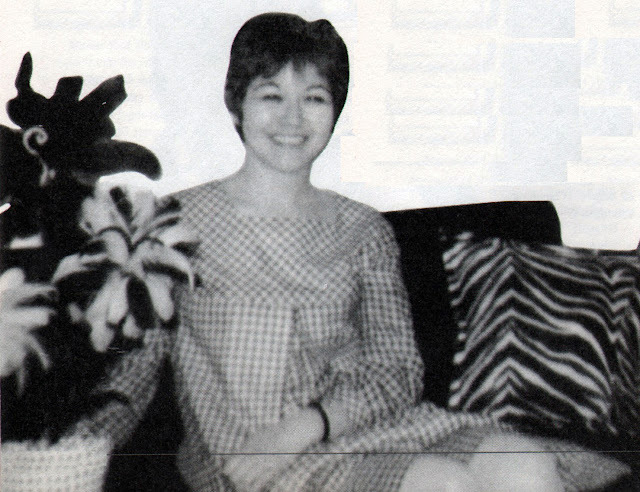 Flo occasionally would visit her closest friend Linda Fite upstate (I believe she was godmother to Linda and Herb's children), so she was familiar with the areas north of the city. On this January day, she said that when the weather got warmer, she'd love to come up and see my wife Maggie at our house in northern Westchester County. The long lunch running late, on the corner of Lexington Avenue and 60th street, we hugged each other and said our goodbyes, with me always telling her to be careful getting back home. In May, Flo called me up to apologize for being away for so long, telling me she had been hospitalized recently after passing out on the street while doing her laundry. As she related, "one minute I was outside the laundromat waiting and the next thing I knew I was on the floor looking up at an EMS worker." The diagnosis was dangerously severe and Flo ended up having surgery for a cerebral aneurysm. She was now back home and doing somewhat ok, all things considered, and would let me know when she on her feet again. I was startled, worried sick, wanting to know whether there was anything I could do and insisting she please take care of herself, something she promised she would do. She was having trouble with her home phone so she gave me her cell phone number to check in with her. About two weeks later I called and didn't get through. The July 4th holiday then was a maze of family events as I spent a week upstate visiting my parents and with my two younger brothers' families. My return began the rush towards the San Diego con. I took Flo's number with me to San Diego, planning to call her from out here and tell her how the con was. I go to San Diego every year and every year Flo wanted a day by day account of what I did and who I saw. In fact, on my cell phone voice mail is a long message from Flo last year asking about all I did and saw at last years con. This message is now priceless to me as she asks about Barry, Nick and my wife Maggie. 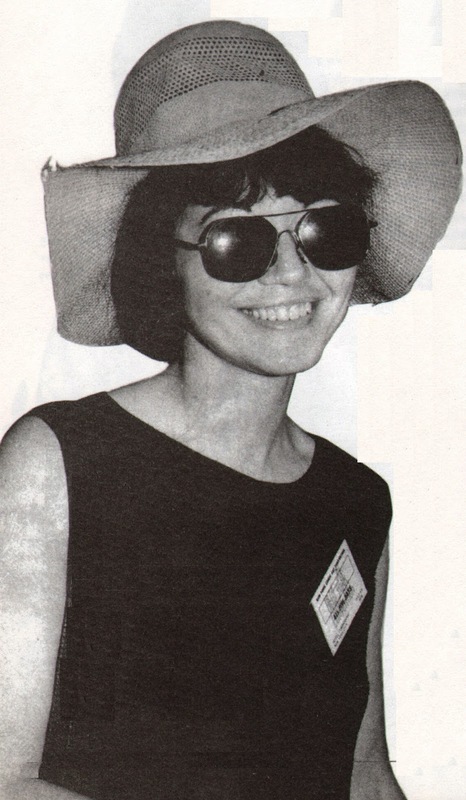 I don't believe Flo had ever attended the San Diego con. She was occasionally invited as a guest there over the years but always turned the honor down, not wanting to travel, nor deal with all the crush of fandom that would certainly occur. Which brings us back to Sunday morning and the sad news of Flo's passing. Social media and news sites were exploding with comments, tributes and reminiscences from folks who knew and worked with Flo back in the glory days of Marvel and her indie/underground days. Fans who received letters from her, feel (understandably so) that a warm piece of their younger life has blinked out. I absolutely know Flo would not want all this fuss over her. The lung cancer was news to me and I'm betting Flo didn't even know about it at the time of our last phone call. From all reports, the end came quickly, which is a good thing. It was Flo's friend Larry Hama who made the announcement. Larry was there for Flo when the final crisis hit. 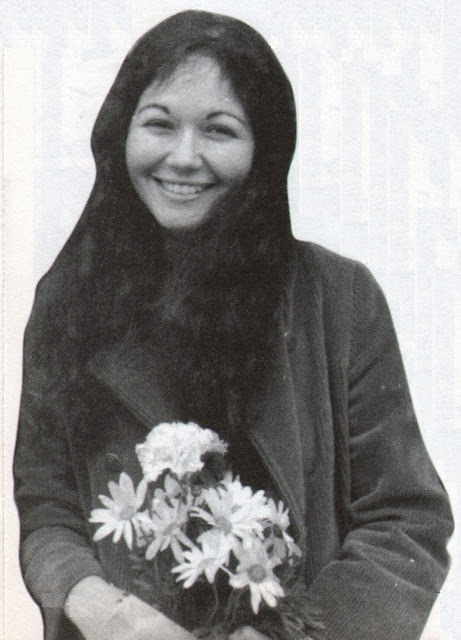 Flo was no shrinking violet, all appearances to the contrary. Neither of us being terribly religious, we'd spoken about and discussed the concept of death and mortality many times over the course of the years. Knowing Flo and knowing how she felt about facing life head-on, I'm sure she faced a Ditko-rendered vision of eternity the same way. Head-on. Today on Thursday, July 27, there was a graveside service for Flo. This morning I cancelled all my afternoon appointments and decided I would try to get all the way up to Ulster County to attend with Maggie. I caught a 12:45 train out of Grand Central and Maggie was waiting at the Croton Harmon station to pick me up, the address of the service in the GPS. It was going to be tough to make it on time, a 90 minute drive with the estimate that we'd arrive at the exact start of the service. Well let me tell you, estimates are wrong. Most of the driving (about 70 miles) was on back roads, rather than highways.The countryside is beautiful! Breathtaking, in fact. A combination of farms surrounded by sheer mountains and state parks. The GPS told us we'd arrived at our destination and it was the middle of nowhere. Tracking backwards, now we were lost. A half hour later, after talking to shop attendants and passer-byes on a main road, to no help at all, I found an online direction to the cemeteries in Ulster County and the proper direction we needed. We had been only a mile away all along and wasted 30 minutes going in the other direction. Just as we pulled up, a last car, the hearse, was pulling away in the opposite direction leaving a solitary worker holding a shovel who told me the service had been about a half hour and I'd just missed it. Maggie and I went over and paid our respects. The worker allowed us to shovel some dirt onto the mound and we did so, four shovels full... Maggie, myself and one each for Nick and Barry. About 20 people had attended and I assume everyone went back to Linda Fite's house, which I was told by the worker, was nearby. We decided to not try to find Linda's house and began to make our way home. The trip was a success anyway, our goal met. We said good-by to Flo, which was all we really wanted to do. Photo of Flo and Dewey Cassell is from Dewey himself and used with permiossion. Photo of Stan Lee is from Maggie Vassallo and used with permission. 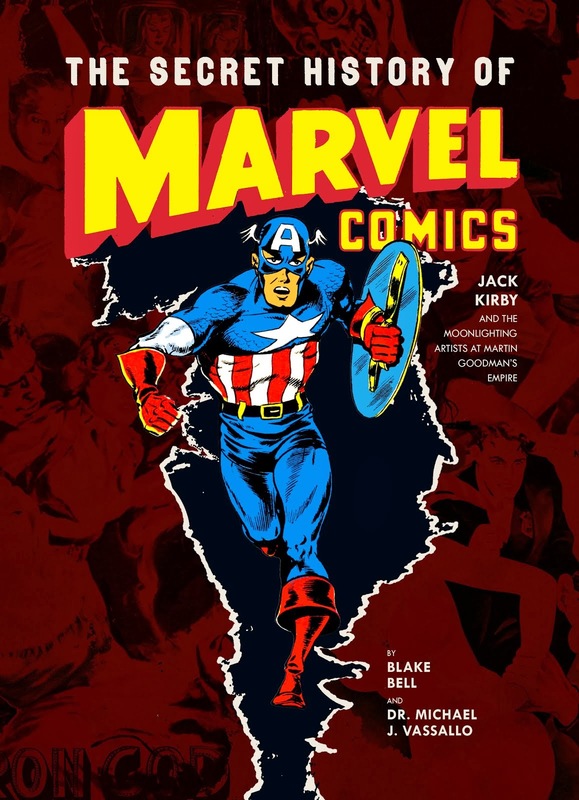 Voices of Marvel recording linked from Youtube. 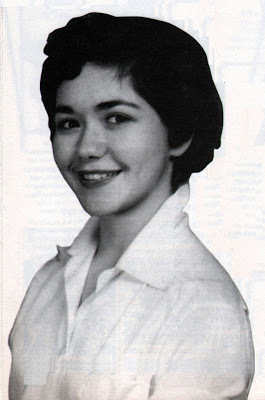 Photos of Flo from younger days were originally from Flo herself, used copiously through the years in various publications. The two photos of Flo at the 2014 NY Comicon as well as the image of the response card are courtesy Kendall Whitehouse. 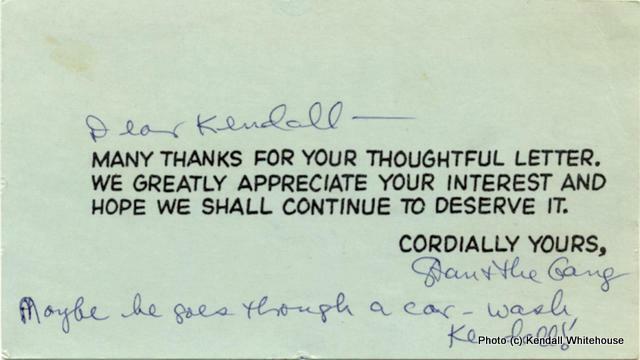 That card Flo is holding in the second photo is Kendal's actual original response card from Marvel that Flo wrote! 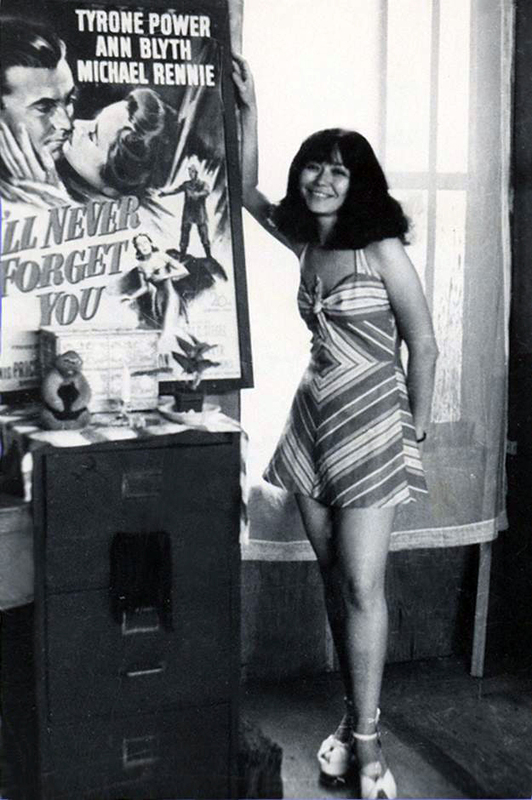 Photo of Flo in 1975 courtesy of musician Todd Tamanend Clark. 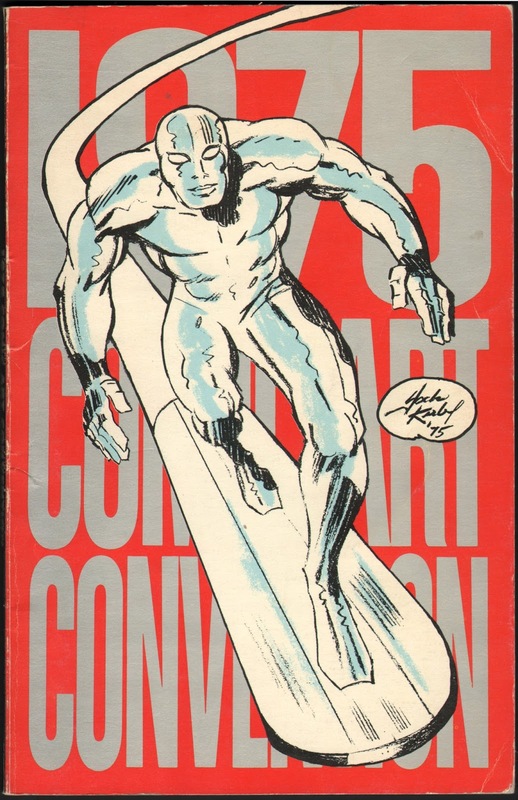 Video of Flo and herb Trimpe documentary used with permission of film maker Jon Michael Riley and Amelia Trimpe. © 2015 Dr. Michael J. Vassallo ; Images copyright the respective copyright owners.. Watermark theme. Powered by Blogger.